We arrived to Paris, France, at about 2:45pm on 4/9 after a brief layover in Frankfurt. Our flights on Lufthansa were on time and comfortable. The plane configuration was 2, 4, 2 in economy, so we lucked out with 2 seats off to the side. Lufthansa served us two full meals with dinner being a choice of pasta or chicken and of course you can enjoy complimentary beer, wine and some cocktails throughout the flight – even in economy. After dinner they offer coffee or cognac. The breakfast meal was an omelet with onions and peppers on top (that were easily pushed off to the side if you didn’t want them) along with some fruit and a roll. We pre-arranged transportation from the airport to the hotel with Olivier Tan, a local driver who we met during our visit last year. He met us with a sign at the baggage claim exit and took us to his clean, comfortable Mercedes van that easily seats 7 guests. Our trip to the hotel was quick with light traffic throughout Paris due to the day-after-Easter holiday. 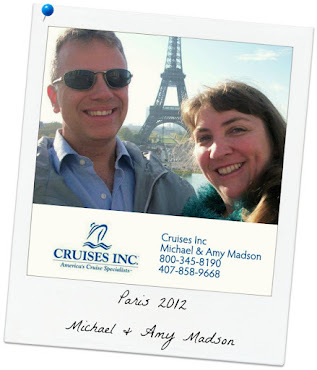 The Mercure Paris Centre Tour de Eiffel was our home for one-night pre-cruise. This hotel was conveniently located 2 blocks from the base of the Eiffel Tour! We walked through the local neighborhoods that evening and found a corner café – Boulangerie de la Tour Eiffel – to dine at for dinner and wine before walking back to the hotel. We went back out after dark to view the twinkling lights on the Eiffel Tour that occur every hour on the hour after dark. We are booked on this cruise with friends in August. We have taken quite a few river cruises, the Nile, Yangzte, Russia, and the Danube and are booked for the Rhone in October as well. The friends have never done a river cruise so I am very excited to see how they like it.